HEY KIDS! Are you crazy big fans of Rick and Morty!! Did you see the Mr Meeseeks frazzled n on the edge plush toy Jinx! sent over last year and thought I NEED MORE ROCK AND MORTY THINGS TO BUYYYYY!!! Well Cryptozoic (masters of unique table top gaming experiences) have come to make your boring lives just a wee bit more interesting. All you have to do is push..a...button. It's the Rick and Morty - Mr Meeseeks Box O’Fun Dice and Dares Game! Don’t disappoint Mr. Meeseeks. He will make you do all sorts of embarrassing and foolish things. That is, if he doesn’t simply kill you off. 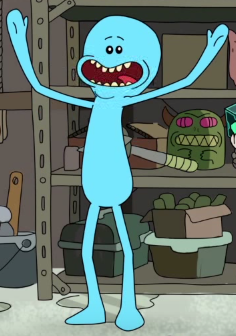 The longer it takes for you to complete your Request, the more Mr. Meeseeks will appear. Soon, they may turn violent. So please, do try your hardest. In the end, the player who scores the required number of Victory Points first wins the game. Score points by completing Requests and doing Dares. Unless you’re chicken. This game requires 2-6 players and takes 20-30 minutes to complete. Game due to release this Fall.